PDS Chairman, John Getty, Richard Branson and Per Lindstrand share a joke in Marrakesh. The objective was to achieve the first ever nonstop circumnavigation of the world by manned balloon. To be able to claim the record, the balloon had to travel a minimum distance of four radians of the earth. The 1998 attempt covered approximately 15,000 miles propelled only by the wind climbing to a height of up to 30,000 feet and speeds of around 250 miles per hour. 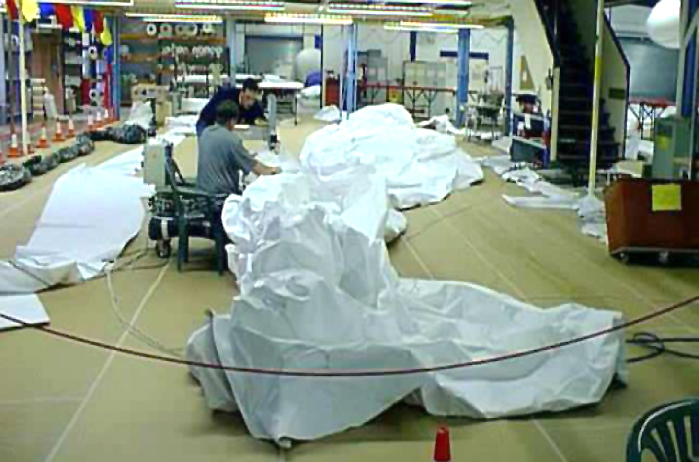 The envelope canopy for the huge balloon begins to take shape in the Per Lindstrand factory in Oswestry. Using the winds of the Jet Stream the brave pilots travelled all the way from Morocco before ditching off Hawaii. The fabric balloon was 1.1 million cubic feet and a combined hot air / helium type. The large Capsule and the critical parts made by PDS all performed faultlessly and Per Lindstrand complimented us on the quality and accuracy of all our work. In the near future Virgin and Richard Branson may well pick up the challenge once more and attempt either the first ladies circumnavigation or perhaps the “First Ever Roun the World Balloon Race”. You can be sure that PDS will be there creating the best machined parts and pressure capsules for Lindstrand Balloons. Virgin Atlantic Balloon “Capsule” for Richard Branson comprised many precision parts engineered by PDS in Nelson, Lancashire.